Earlier this week, I wrote about how to find a spiritual father, steps one and two. Steps one and two are absolutely crucial, so be sure to read them in detail if you haven’t already. 3. After identifying what you’re called to (at least for now), ask the Lord to show you some skill sets and areas of knowledge that you need to develop. Are you called to pastor people, but you don’t know how to get life-on-life with your sheep? That’s a skill set you’ll need to develop. Are you called to prophetic ministry, but you don’t know how to hear God? You’ll need to learn to hear God before you can function in prophetic ministry at all. Do you want to reach people with the Gospel through signs and wonders, but you don’t know how to pray for the sick, cast out demons, or interpret dreams? You’ll need to learn how to move in power and purity before you’ll be able to carry out your ministry. 4. Ask God to show you some people to whom you could listen and from whom you could learn. This doesn’t mean you’re narrowing down the field to one person who will be your spiritual father or mother yet. In this step, you simply write down the names of some people from whom you can learn. Ask the Lord who He has in mind to father you. Invest time in prayer about this subject. It’s a big deal, and it’s worth your time to pray about! As you pray, several names may come to mind. One of those, however, will probably stand out as someone to whom you feel very drawn. That person will probably be someone who also operates in the same thing you are called to do. Be mindful, however, in this stage that you need to test your feelings against the Word and wisdom. If a person doesn’t demonstrate proven godly character, affirmed by godly leadership, then they would not be a suitable spiritual parent. If a person is not submitted to godly authority, they would not be a suitable parent. You can only have authority as much as you are under authority. Stay away from spiritual lone rangers. Men should mentor men and women should mentor women, unless a married couple together is mentoring an individual or another couple. After you’ve prayed about this and have some names, think of the person (or married couple) you feel drawn to the most. Pray for godly wisdom and discernment. Ask the Lord to open a door to relationship with this person if you don’t already know them. Ask the Lord to bring you to this person’s mind and give you favor with them. Ask the Lord to establish a fathering relationship between you and this person if it’s His will to do so. After you pray, it’s time to act. The next post in this series will tell you how to begin establishing the father-child relationship you’ve longed for by sitting at the feet of the prophets. 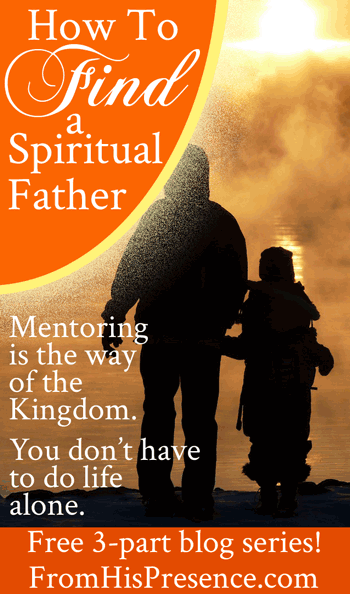 Click here for Part 3 of “How To Find a Spiritual Father”! In the meantime, go ahead and work on steps 3 and 4. What gifts and skill sets do you need to develop? Who could teach you the skills you need? I used to read alot of Watchman Nee…..think I will really look into AW Tozer. Nice to meet you. Nice to meet you too, Daniel! And I will stop and pray for you right this minute. May our God show Himself as your very present Help in trouble! This is EXACTLY what I am looking for . Thanks! And may God’s grace continually find expression in everything you do!